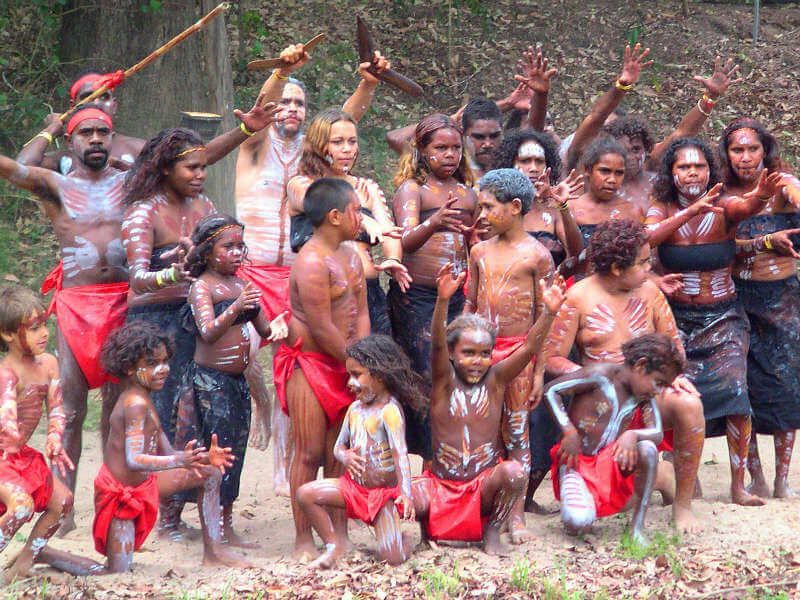 Aboriginal people perform a traditional ceremonial dance. Photo by Marcus Bichel Lindegaard. Community is everything for the Aboriginal people of Australia, but especially after a bereavement. 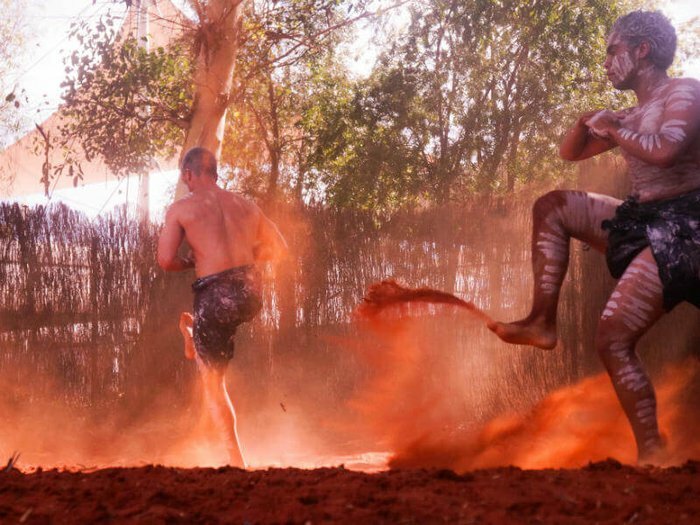 In the UK we may acknowledge that support from family and friends is important after the death of loved one, but for the indigenous peoples of Australia, funeral ceremonies are intrinsically a communal time where mourners come together to grieve as one. Indigenous Aboriginal people constitute 3% of Australia’s population and have many varied death rituals and funeral practices, dating back thousands of years, long before the first European settlers discovered the country. Aboriginal people may share common beliefs, but cultural traditions can vary widely between different communities and territories. These cultural differences mean that funeral traditions, sometimes referred to as ‘sorry business’, are not the same across all Aboriginal groups. 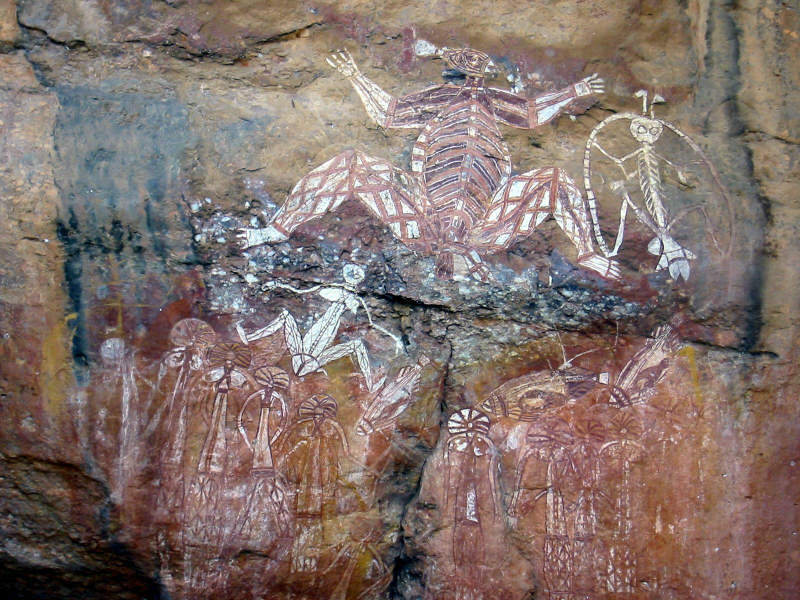 Aboriginal rock art in Kakadu National Park, showing a Creation Ancestor being worshipped by men and women wearing ceremonial headdresses. Photo by Thomas Schoch. Aboriginal religions revolve around stories of the beings that created the world. The Creation Period, or ‘Dreamtime’ was when powerful Ancestral Beings shaped the land, building up mountains, digging out lakes and creating plants and animals. From as early as 60,000 years ago, many Aboriginal societies believed that the Ancestral Beings were responsible for providing animals and plants for food. As a result, religious ceremonies in honour of the Ancestors were a vital part of everyday life, to ensure the continuing good fortune of the community. Funeral rituals are equally ceremonial. 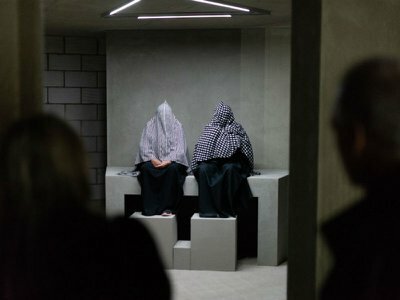 Though precise beliefs can vary, a common purpose of the funeral ceremony is to ensure the safe passage of the spirit into the afterlife. Some Aboriginal people believe that if the rituals are not done correctly, the spirit can return to cause mischief. 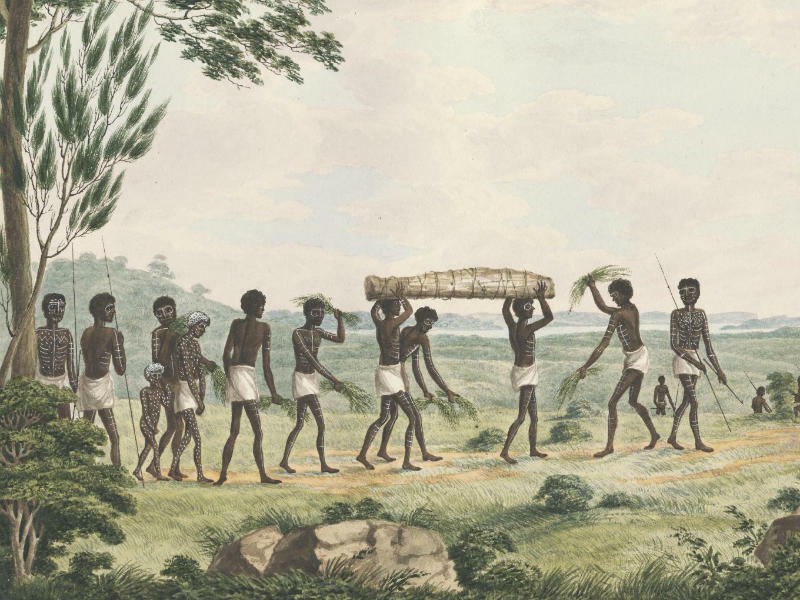 An Aboriginal Funeral, painted by Joseph Lycett in 1817. 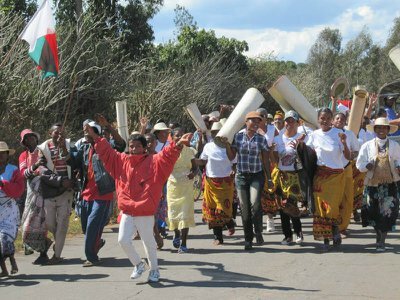 The funeral procession, each person painted with traditional white body paint, carry the body towards the burial site. In the past and in modern day Australia, Aboriginal communities have used both burial and cremation to lay their dead to rest. Traditionally, some Aboriginal groups buried their loved ones in two stages. 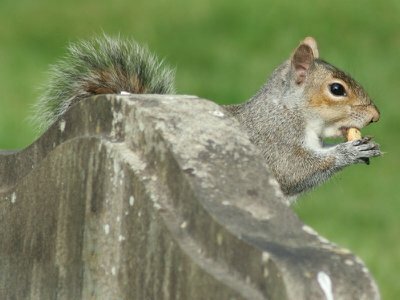 First, they would leave them on an elevated platform outside for several months. Then, once only the bones were left, they would take them and paint them with red ochre. The painted bones could then be buried, placed in a significant location in the natural landscape, or carried with the family as a token of remembrance. However, in modern Australia, people with Aboriginal heritage usually have a standard burial or cremation, combined with elements of Aboriginal culture and ceremonies. Aboriginal dancers in traditional dress. Photo by NeilsPhotography. Funerals and mourning are very much a communal activity in Aboriginal culture. Families, friends and members of the larger community will come together to grieve and support each other. Ceremonies can last for days and even weeks, and children may be taken out of school in order to participate. 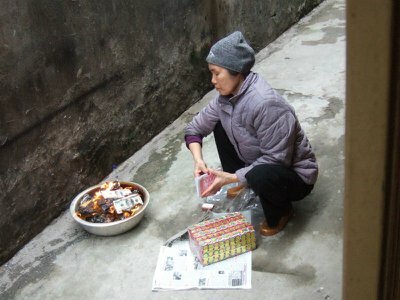 There may not be a singular funeral service, but a series of ceremonies, dances and songs spread out over several days. Each of these may have its own structure and meaning, according to that community’s specific traditions. Within some Aboriginal groups, there is a strong tradition of not speaking the name of a dead person. It is believed that doing so will disturb their spirit. They may use a substitute name, such as ‘Kumanjayi’, ‘Kwementyaye’ or ‘Kunmanara’, in order to refer to the person who has died without using their name. Photographs or depictions of a person who died may also be seen as a disturbance to their spirit. This is why some Aboriginal families will not have photographs of their loved ones after they die. Not all communities conform to this tradition, but it is still commonly observed in the Northern Territory in particular. Ultimately, Aboriginal funeral traditions are incredibly varied and unique to each group. However, one aspect seems universal: The support and unified grief of a whole community as people come together to pay tribute to those who have died.